Reported by an AppleInsider reader identified as "Michael" and confirmed by AppleInsider's own tests, attempts to make an online reservation with the Genius Bar at an Apple Store are failing. Users are able to make appointments with an Apple Authorized Service Provider at this time, but not through Apple's main support channels. An attempt to call Apple Support over the phone to arrange an appointment also failed for the reader, but was informed by support staff that this is being worked on internally. 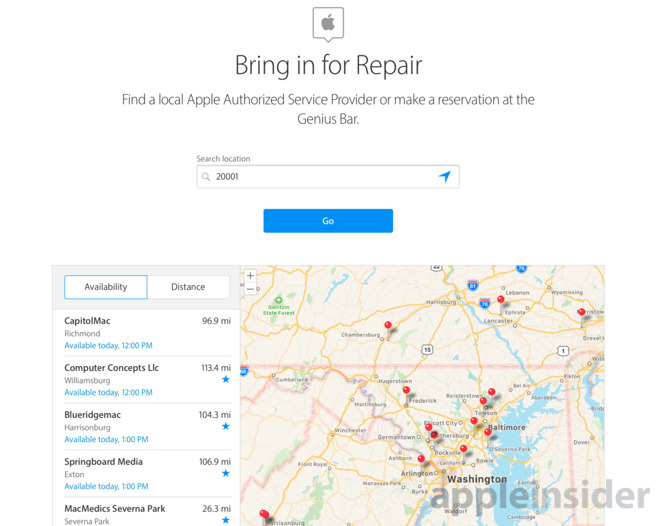 When attempting to make a booking through Apple's support site, the option to find the nearest Apple Retail Store or Apple Authorized Service Provider comes up with a list of AASP locations, with no Apple Stores appearing on the list at all. AppleInsider found this to be the case in both the United States and the United Kingdom, suggesting it to be a general outage rather than specific to a region. A source inside Apple corporate not authorized to speak on behalf of the company told AppleInsider the company is "aware of the problem" and it is a "temporary issue." No timescale was provided for the fix, but Apple anticipates getting the booking service running again today. While the reservation system is down, the source advised stores are "fully aware" of what appointments are currently booked in for today, and will be providing support services as normal. Update: As of 1:50pm eastern time, the booking system has been fixed, with Apple Stores now appearing in the map view.